Showing a photo gallery in your website pages or news articles is a simple process. Every teamthing.com website contains a powerful media library which you can use to upload photos and images. Using this media library you can group your photos into galleries and then show these galleries to your users in your news articles and pages. 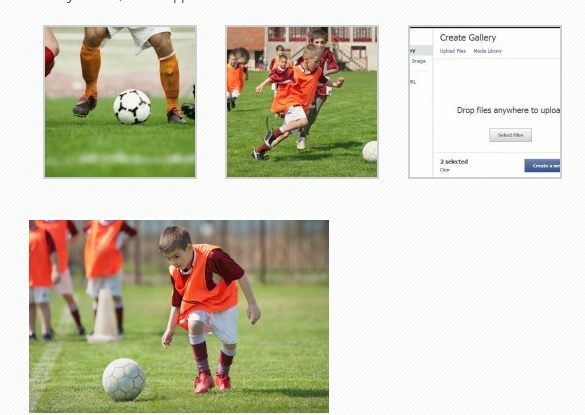 Follow the steps below to upload images, group them into galleries, and then insert these galleries into a new item. Just create a new post/page (or edit an existing one). Place the cursor in the editor text box where you want the gallery to be placed. On top of the editor text box you will see a number of buttons. Choose the ‘Add Media’ button. A popup screen, showing your media library, will appear. On the left hand side of the screen there will be a ‘Create Gallery’ menu option. Choose this menu option. The create gallery window will display two menu options at the top of the screen: ‘Upload’ and ‘Media Library’. Choose the ‘Upload’ option. Either drag an image from your system on to the area which says ‘Drop Files Here’, or, click the ‘Select Files’ button and select the file you wish to upload. The image will be uploaded to your media library and automatically selected for inclusion into your new gallery. Review the settings for your gallery and click the ‘Insert Into Post’ button. Publish your changes and view the published article on your website. N.B. If you want to embed a Facebook photo album into a page/post just read the following article.